This beautiful 5 Foot Cypress Porch Swing with cupholders is handmade in the USA. It features select 99% knot free cypress wood. This particular wood is known as "The Eternal Wood" because it is a very dense and naturally insect resistant wood that will be around for many years to come. It does not require any treatment and will weather to a beautiful grey. Most people prefer this look, however if you are interested in maintaining the current color longer, you can stain and/or seal it prior to hanging. The swing has two cupholders, one located on each armrest. This layout is preferred, as it does not take up any of the seating space. Additionally, there is no tailbone slat for added comfort while sitting. The back is specially crafted for lumbar support and the chains are positioned to help prevent flipping. 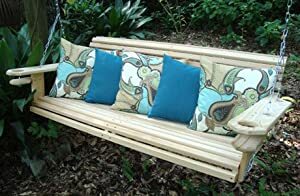 The swing has the following measurements: 5' long Cypress Swing ~ 65" wide including arms ~ 5.5" wide armrests ~ 20" deep seat ~ 5' wide seat ~ 20" high back rest ~ solid 1+" tick slats ~ can be assembled in 10-15 minutes ~ arrives sub-assembled, meaning the back and seat are already assembled ~ simply attach the two to the armrests, run the chains and hang ~ solid steel nuts and bolts ~ brass plated screws ~ cushions do not come with the swing (shown for visual effect only). Swing usually ships within 4-5 days via FedEx and is typically only a 2-3 day ship. All purchases include free shipping insurance for your added convenience. Rest assured that I will be around in the future should a piece ever break, requiring a replacement.